These EASY Bacon Topped Petite Turkey Meatloaf with BBQ Sauce are so moist with the addition of grated zucchini to the meatloaf mix! We have turkey meatloaf at least once a month. I like to switch it up so I am not always making the same one, sometimes we have this Cheese Stuffed Turkey Meatloaf, and sometimes we keep it simple and make Classic Turkey Meatloaf. 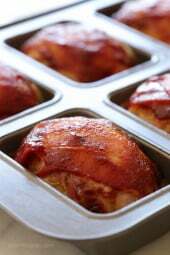 But if you like the smoky-sweet flavor of BBQ sauce AND the taste of bacon, then your family will love these petite turkey meatloaves with some hidden zucchini inside! but you can also make them in a muffin tin. My secret to extra moist meatloaf is adding shredded zucchini to the mix. I’ve done this before in my and meatloaf cupcakes and it turns out great and no one knows it’s in there. I also prefer to use 93% percent lean turkey rather than 99% which I find comes out a bit dry. To make this in one larger loaf pan, bake in the oven for 1 hour. I made them in a petite loaf pan but you can also make them in a muffin tin directly on a sheet pan, just form them into mini loaves with your hands. 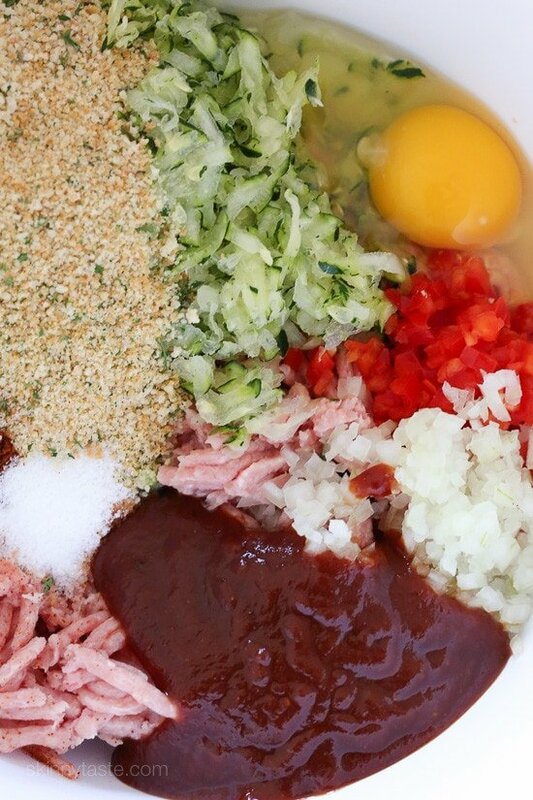 In a large bowl, mix the zucchini, onion, red pepper, breadcrumbs, BBQ sauce, egg, paprika and salt. Add the turkey and combine until mixed through. Create 5 equal loafs and place them into the loaf pan. Place the 2 bacon halves over each loaf and top each with 1/2 tbsp additional BBQ sauce. Bake about 25 minutes or until cooked through. OMGEE I had one left in the freezer at work (from a lunch I didn’t get to eat) and even thawed out, its SO DELICIOUS! I’m going to have to make them again this weekend! Moist, tasty and that bacon and bbq sauce brings it to the next level! Thanks for another winner! The best meatloaf I’ve ever had! So delicious and moist! Leftovers for lunch tomorrow’! So agree with you, do NOT use 99% lean turkey it will clump and be so dry. I have made a similar recipe (but using Stonewall Kitchen Mom’s Meatloaf Mix) for the barbacque sauce and it’s one of my favorites. Will try this too. I make my own freestanding mini’s since I live alone and cook them at 350 for about 25/30 min. Are there any alternatives to the breadcrumbs to lower the carbs? Is there any alternative to the bread crumbs to lower the carbs? Delicious Meatloaf! I also added 3/4 finely cubed cojack cheese. I didn’t have zucchini, but used yellow squash. It didn’t seem to make a difference. I added poultry seasoning with oregano as I did not have any sage on hand. All and all a great meatloaf. Going to try to make individual round thick meatloaves wrapped in bacon. I’ve made these before with another beef meatloaf recipes. Ones I don’t bake immediately, I freeze and bake later. I am single so I can have meatloaf any night – I just pull them out of freezer and bake. They still taste great. Made this with 99% Fat Free Turkey (0 points) and the G Hughes Sugar free BBQ – Hickory flavor BBQ sauce. Everything else the same, but made 6 servings. Sooo good, and those little changes got it down to 2 points each! Thank you for sharing Gina! Love it! We loved these. So tasty!! Good Lord! Made this for dinner last night, and I am eating one left over for lunch as I type this. These little meatloaves are heaven. I followed the recipe almost exact, which was super easy by the way. I used BBQ sauce I had on hand instead of making the homemade. Only thing was I didn’t have one of those mini loaf pans so I made mine round and put them in the large muffin tin. They are so ridiculously moist and the flavor is amazing. My husband and daughter loved them too! These are going to be made regularly!!! Made this tonight. I didn’t have zucchini. I subbed broccoli slaw that I sautéed with the onion, cooled, then added. It was great! Can you please let me know how you came to 8 Freestyule point? When I put it in it is 2 without the sauce so I would add 1 pt for the BBQ. I absolutely love this recipe, i actually leave off the bacon because i find it doesn’t crisp up nicely. My other half does not usually like meatloaf, but will eat this recipe. You show that the Freestyle points as 8. When i put all the ingredients into the WW recipe builder it only gives me 4 points. I love this recipe. It’s perfect for mealprep because each night after work I just take out a single meatloaf and prepare my veggies! I also love that veggies are HIDDEN in the meatloaf itself! I use turkey bacon instead of regular bacon since I don’t eat port. Absolutely delicious! Would it be OK to omit the Zucchini? My husband would find it and is super picky. I was thinking to leave it out of 1/4 of the meat mixture and make it as is for the rest of us. So is the red pepper, a red bell pepper? I have made this several times with great success! It is an awesome Recipe! I have precooked the bacon half way so that it becomes very crispy during the baking of the meatloaves! Thank you!! My husband and I had this meatloaf last night and ABSOLUTELY LOVED it! Your website is a lifesaver. We have been dieting on Lean Cusine for almost a year. We were so tired of frozen meals and wanted to control the ingredients we use. I can’t say enough about how much we appreciate that you share these recipes on the internet. I just ordered your books and can’t wait to get them. One might be arriving today! Seriously, thank you SO MUCH for the work you do. I have no doubt your work helps thousands of people stay healthy. What can I substitute for the egg? My son has food allergies to milk, eggs, peanuts, and tree nuts. Thank you! 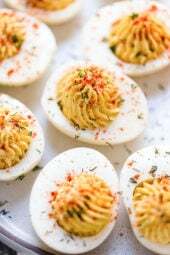 I love this recipe and my kids too! Can I use this recipe an make a regular loaf using all the ingredients listed for this recipe? Can I make one big loaf and bake for 60 mins? Delicious my new favorite meatloaf recipe. I loved the veggies in. It. I have made this many times. It freezes very well. I love having it ready in case we have unexpected guest for dinner. I hardly use regular bacon anymore but use the crumbled bacon from Costco and it works great. This is a main staple in our house now. In fact I’m making a double batch now to have some for later. Everyone raves about it! Thanks Gina! Have you made this using turkey bacon? I just already have some so I thought I would use it but its okay if not! I make something similar but add a small amount of turkey sausage to mix, and instead of putting bacon on top chop it up,putting it in the mux. We usually cook ours on a pan in the smoker outside for the smokey flavor. Bonus doesn’t heat up your kitchen in the summer months. I made these tonight and didn't have bacon, but instead I subbed in a little ground beef and ground pork. I wanted to keep the fat content low so I kept it mostly ground turkey. Really good! i made this for dinner tonight – sans the bacon – but i made the bbq sauce home made from your recipe. it was such a HUGE hit. my boys loved it and my husband. thanks so much! i doubled the recipe so now we have lunch tomorrow. I made this for dinner last night. My husband ate 4! I say that is a winner! Making the turkey/bacon meatballs tonight with some wild rice and I expect that to be gobbled up just as quickly! Thanks for all your wonderful recipes. Doesn't it defeat the purpose of using lean turkey meat when you top it with fatty bacon? Bet it tastes good though. We like ketchup on meatloaf. Do you think it would taste alright instead of BBQ sauce? love this idea but wanted to ask, what can I substitute for the red peppers – can't eat any peppers. I would say maybe celery? I know this is way late but I would sub sun dried tomato! made these last weekend and my husband and son devoured them! Keep those awesome recipes coming. This looks delicious! I love the addition of the zucchini to give it some added nutrients, too. This really does look wonderful. I can't remember the last time I had meatloaf, but that's probably because I'm allergic to tomatoes and have never found a BBQ or ketchup-less recipe to tackle. Would you happen to have any ideas of something I could substitute for BBQ sauce? Yes, freezer friendly too! Good point! Do you freeze these raw or cooked? And if raw, do you thaw first or cook from frozen? I’d love to make some ahead for during the school year! I made these last night and they were quite good! My husband loved them!! I also added 1/2 c 2% sharp cheddar cheese. Next time I will broil it at the end to crisp the bacon up a bit and also add a T of worcestershire for a bit of a kick. def. made this for dinner tonight with mashed potatoes and strings beans. My husband loved it and suggested that I double the recipe next time. Gina, you make weight watchers doable and delicious. thanks again. BTW def go for the chew weight watchers chef. your meals are too amazing and the nation needs to know! I love this recipe, but am now trying to go grain free. Do you think I can make this with Almond meal instead of bread crumbs? not as concerned about the points as whether it will work. Thanks. I made it last night and just left out the bread crumbs and it worked fine. it was so moist and flavorful. I didn't have any red pepper so I finely chopped a carrot instead. Very moist! Another awesome recipe! 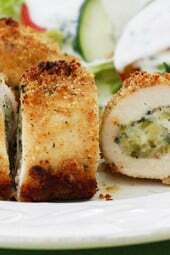 I've made this recipe a few times and my recommendation would be use cheese cloth to drain the zucchini, fluff with a fork and then measure. This has saved me a lot of paper towels and is a bit neater. Thanks for adding bacon! Excellent!!!! The kids said it was delicious and moist. This will be a permanent recipe for me and my family. Oh wow! We had this last night and loved it. The Lovely Boyfriend said he likes it better than "regular" meatloaf. He's not on a diet, so he helped himself to two! lol Thank you! I made this tonight and my whole family enjoyed iy. My 17 y.o. who hates meatloaf decided to try it because of the bacon and he loved it! This was amazing. I made it with your Broccoli and Cheese Twice Baked Potatoes. My husband was whining about using ground turkey instead of ground beef and after he started eating it, he said "ya know, I think this is better than regular meatloaf". Plus, my extremely picky 3 year old ate it without complaint. He even asked me to make it again. Winner! My beef-loving husband went back for a second mini meatloaf! He said his only complaint was my little tins weren't big enough. Compliments to the chefs!! I got those zucchini shreds by him soooo stealth-like, too! Amazing meatloaf! Definitely a hit in my family. I ended up making a Big loaf and using beef because I didn't have the ground turkey. I also had to make it Gluten Free and made GF breadcrumbs with 2 heels of Udi's GF bread. Turned out AMAZING!!! My three boys ended up fighting over the last piece. Making it again tonight and doubled the recipe in hopes of having leftovers. Thank you for your amazing site and recipes. You are the first place I go when looking for a recipe. What would you suggest as an egg replacement in this recipe? Thanks! This was really tasty. Even my confirmed meatloaf-hating son ate it. This was ridiculously good. I made in one big loaf (cooked for a little under an hour) since I don't have the mini loaf pan. My boyfriend, who usually dislikes it when I use ground turkey for things he thinks should be made with ground beef (like meatloaf, meatballs, etc), really really liked it, and even yelled THIS IS DELICIOUS while eating haha. He also mentioned it again the next day about how good it was. I literally lol'd at the exclamation by the bf – I live with the same type; this recipe is definitely a winner at our house, too! Made these tonight and they were WONDERFUL! Made them in a cupcake pan and they turned out great. Will definitely be making often. We had these tonight for the first time – definite do-over! I made your zucchini tots tonight as well, since I had to grate zucchini anyway! They're a do-over, too! Did you freeze them ? do you have to use smoked paprika? will regular do? Found you on pinterest and have made a couple recipes – all really good 🙂 Thanks for sharing recipes that I feel good about giving my family! I made this turkey meatloaf last night for dinner – it was so good! Used muffin tins, but I might have to get a petite loaf pan – so cute 🙂 Anyways, I switched a couple things because I didn't feel like loading the kids up for a trip to the store, but it was amazing anyways. I have tried a TON of meatloaf recipes for my husband…he's just never liked it. His exact words on this one? "That's pretty good." A glowing recommendation from him 🙂 And both of my super picky kids ate it. My little guy even asked for more. I don't know that he's ever done that before. Thanks again for sharing!! This was delicious! The zucchini really helped the turkey stay moist, and it was full of flavor. Thank you for all the great recipes you share! 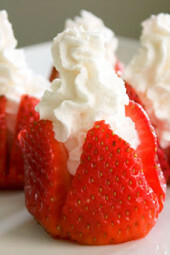 I just made these tonight in a muffin tin and they were FANTASTIC! Moist and loaded with flavor. I divided the meat into the 12 tins and cooked for 20 minutes; I then set the oven to broil, moved the rack up and broiled for 2 minutes to get the bacon crispy. Fantastic! Thank you for a wonderful recipe! Any suggestion on substitutions for the egg? My little guy is deathly allergic. Try it without and see if it works. How about milk or applesauce for more moisture to hold it together if no eggs. My mother's meatloaf recipe used milk. I know it sounds strange. I made this last night as one whole loaf, baked at 350 for an hour. Worked fine. The zucchini is GENIUS. I had tried turkey meatloaf with 99% fat free meat before and it was disgusting. This was tender, juicy and very tasty. Thanks so much for a great idea! I made these last night and they were amazing. The boyfriend said they are on the make again list. The only thing that I had an issue with was the bacon did not get as crispy as either of really like it. So next time we will pre-cook the bacon a little bit. We made this w/the Roasted Parmesan Green Beans which was an excellent combination! I made this tonight and it was amazing! I didn't want to heat up my kitchen with the oven so I grilled them on the grill like I would a hamburger and just basted with the BBQ sauce after I turned them. The flavor was so good! Hubby loved them and I will be adding this to the rotation! Thank you! Can this meal be prepped ahead of time and then baked the following day? Thanks Gina! Can you make this as one whole loaf? I don't have that pan and I want to make this soon? Made these last night, and we're a complete hit. Also I found the multi loaf pan at William – Sonoma too. I'm not really that fond of ground turkey….could i use 96% lean ground BEEF instead??? What is the cooking time if you do it in muffin pan (the 12 muffin ordinary size pan)? Can it be done without breadcrumbs (gluten free)? How do you think it would be if you subbed torn pieces of bread soaked in the egg for the bread crumbs? Could you replace the breadcrumbs with something else to eliminate some carbs? You can use oats instead, still has carbs but it's good for you! If I do it on the grill, Do I cook the bacon before hand or will it cook on the grill? I am grilling on coals, so how long does the meatloaf need to grill and how hot? Love this idea! I would make sure the foil has a tight seal, like little tents. Do them individually and I would put them on indirect heat but at a high heat so they cook. You may need to move them a bit onto the coals at the end. Oh and don't cook the bacon, it will bake in the foil. Made this for dinner tonight and it is very good! My picky teenager even liked it! Thank you for another great recipe! I made this last night in a muffin tin – my husband said it was "the best meatloaf he's ever had in his life"… and he loves meatloaf! I made it with baked rice w. peas AND beet salad — both recipes from this very site. It was a Skinnytaste dinner and was a WINNER!! For those without a pan I just form the meatloaf into a similar shape and bake on a cooling rack on a foil lined cookie sheet. It works great and any fat just drips below. Could you make this into patties? For those who don't have the mini meatloaf pan, I've seen mini meatloaves done in muffin pans with great results. I have no idea how it affects the cooking time, but its definitely an idea! How about the large (texas) size muffin tins? They would work but not sure on cooking time. I just made this in the Texas size muffin pan. I made 6 muffins. Cooked for 25 minutes, perfect. And delicious. I’ve also made mini meatloaf’s many times simply by forming them like a mini meatloaf on a baking sheet or shallow pan just as you would one large free standing meatloaf. Comes out just the same! We are going camping this weekend. How do you make it on a grill? Also, can you suggest some recipes that are easy for camping trips? Make sure the foil has a tight seal, like little tents. Do them individually and I would put them on indirect heat so they don't burn. Open it after 25 minutes, and cut into one to see if it's cooked, if not leave it another 10 minutes or so. So excited to make this! I do not have a petite loaf pan and would like to make this tomorrow– would I use the same temp and time to make it as one large loaf? Yes, but it will take longer to cook. You can look at my turkey meatloaf recipe for the time. I found your site last week, and am so impressed with your use of "forbidden" ingredients (like yummy bacon!) in healthy moderation. Especially with a blog that has "skinny" in the title 🙂 There are so many recipes on here that I can't wait to try, thank you so much!